This special four day workshop is a hands-on history lesson about fused glass and is the first of a series of three workshops now taught by Richard La Londe in his studio located on beautiful Whidbey island near Seattle, Washington. During this event we will make a beach sand mold and fuse/slump window glass and enamels into it making a glass leaf bowl. You will have a chance to view Richard’s 1950’s enameled glass collection. Next we will work with “tested compatible” Bullseye glass using 3 mm and 6 mm sheet glass, crushed glass frit mixtures, the liquid glass line method, multiple firings, silver foil, and various techniques that La Londe has developed. Each participant will create (3) 8″ x 8″ fused tiles, slump a bowl, and make an aluminum backing plate to mount one of your glass tiles for wall hanging. There are 8 hands-on projects in this class. A field trip is planned to a local glass blowing/cold working studio and a “wine and cheese” hour will allow each participant to share their work with the group. Wonderful lunches are included and will be cooked by a local chef. This is a chance for you to interact with a glass fusing pioneer in his own studio! Experience in basic glass fusing is suggested but not a requirement. This brand-new workshop and is the second of three classes now taught by Richard La Londe in his studio located on beautiful Whidbey island near Seattle, Washington. Wonderful lunches are included and will be cooked by a local chef. We will warm up our skills and combine a variety of techniques from La Londe’s first Workshop, the Frit Fusing Extravaganza. Using the Frit on the Shelf, Clear Frit Overlay, and Liquid Glass Line techniques will fuse Bullseye glass to make a “Multilayer” fused glass tile. Next firing up small glory holes we will make glass stringer, twisties, and squirrelies to add to our projects. A major focus in the class will be on creating quick fusing and slumping molds. We will rigidize ceramic fiber board to make a ring sagging mold for our fuse/slump leaf-print plate. We will also create our own ceramic fiber “wet felt” to make a mold and slump glass. Another fun project will be to create a self-portrait / mask in a fiber blanket mold and then build a metal stand to show it off. There are 9 hands-on projects in this class. This is an opportunity for you to interact with a glass fusing pioneer in his own studio! 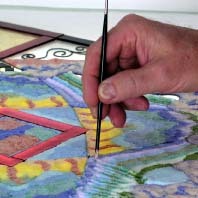 Completion of Workshop I and a basic knowledge about glass fusing is suggested, but not required. Make larger fused glass pieces and take your art to a professional level! Participants in this Master Class will design and make a 20″ x 20″ wall piece with an aluminum backing plate – ready to hang on your wall. You will also fabricate a “La Londe-style” wavy stainless steel mold and combine hot glass work with kiln forming. We will photograph the glass pieces that we make and pack our work for safe shipping. Professional practices, including galleries, public art and other opportunities will be discussed. Requirement: You must be proficient in glass cutting, glass fusing, and also have attended one of my workshops where you learned the “liquid glass line” technique. This special 5 day class is limited to 6 artists and your participation will selected from your application. All content and images © Richard La Londe 2019 All rights reserved.